Black metal is not a musical genre; it is a state of mind, according to Ihsahn. During his time as lead guitarist, vocalist and composer for Emperor, he made some of the most technically complex music of Norway’s second attack. Since then, he’s made his mark as a forward-thinking artist in his own right, both in his matrimonial project Peccatum, and in his prolific solo career. Even when working with eight-string guitars, programmed drums and saxophone solos, his work is as sinister as it is melodic. Ihsahn’s new album, Das Seelenbrechen, has fewer metal elements, and more bizzare experimentation, than ever before. According to the mastermind himself, that’s all part of the plan. 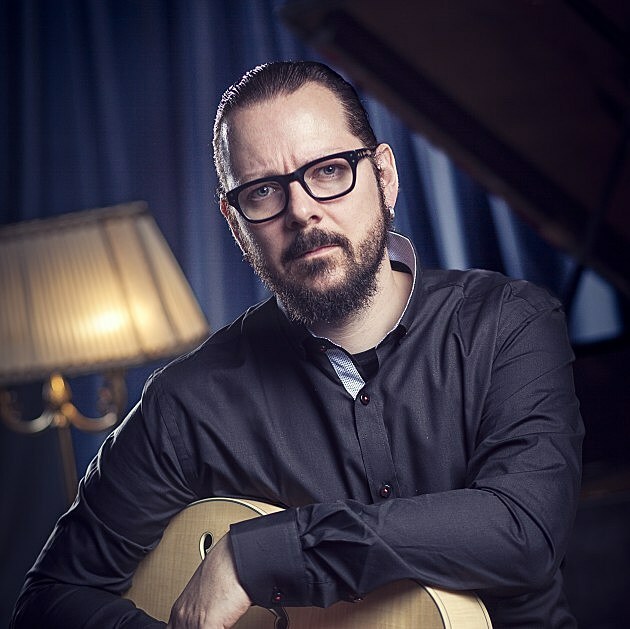 Ihsahn insists he will doggedly persue his solo career and make his mark as a singer-songwriter who pushes his own boundaries no matter what. Your new record has moved your career in more of a jazz-rock vein, unlike your work in Emperor, or your first few solo records. Why now? Yes that’s true. Just to be clear, this album is not a new direction for my solo venture, it’s more of a necessary and deliberate side-step in order to reset the parameters before I continue the road I was going on the four previous albums. I couldn’t immediately go on after having done those four previous albums, particularly After and Eremita, with the eight-string guitars and saxophone and these structures that kind of build. So, I needed to do ssomething different to motivate myself and push myself out of my comfort zone. I grew up with metal, but also with Diamanda Galas and more experimental music; I’ve always admired musicians that dive into it like that and express something right there and then without filter, or polishing it too much. At the heart of this, the inspiration has been similar to that old school black metal atmosphere that I come from. The idea, in my mind, was to really get close to that creative force in its pure form and create something in a very black metal state of mind in different means. In my mind this album is still very black. Of your solo records, It’s the most moody, but also open. The titles and lyrics leave a lot up to the listener. Something like “NaCl,” salt . . . it’s very abstract. I’m glad you say that. In all my abstraction I try to be clear on some side. Musically, it’s quite clear that this is different, but to emphasize it, I wanted the cover and title to illustrate that — I’ve never used a German title before. Even the song titles are cryptic, for me. Everything, I hope, says something to the listeners. This is not an album that will give you anything for free. You have to pay attention. This is not an album you put on for partying or vacuuming. You’ll get the best experience putting on the headphones and setting off the hour, listening from start to finish. I was deliberate about this not being an easily accessible album. For the past two albums, you’ve brought Leprous on tour with you as a backing band. Is that something that will continue? You know, I’m not sure! They’re touring a lot now. They’re on a European tour now, but after that they’re doing three shows with me in Japan and then they’re back on tour again. That’s probably all we’re playing this year, and then next year I’m doing these Emperor anniversary shows. So, on the live side of things I will stick to that. By the time I do any more live shows that might include this material it will be 2015. I’ve not been able to think so far ahead as to how to approach it. Having them as a full backing band is hard; they’re very active unto themselves. Well, if you’re bringing up Emperor — let me get the boring question out of the way — what are the odds I will get to see an Emperor show here in America? I’m sorry to say that will probably not happen, no. It’s impractical due to who is in the band and who can get a visa. But you’ve also only played two solo shows in the US, while you’re about to play three in Japan. Why not more? It’s so difficult to do all the paperwork and get a working visa for everyone involved. I assure you it’s more tedious than getting everyone to Japan. It’s so hard to get promoters to pay for petitions and file work for visas back and forth through the embassy. You wouldn’t believe it. For the most part I’ve been doing European shows, but not even that many of them. The shows I’ve played in the US in the past both as Emperor and Peccatum, and recently with ProgPower and Maryland Deathfest, have been a great time, but I’m one person and I mainly stick to festivals for the sake of priorities. Japan is streamlined, because they’re all very small businesses, and easy to work with. It’s easy to go and play three shows in three days. That light touring schedule must enable you to keep making these solo records so quickly. Yes, for me that is the priority, but I’ve come to enjoy playing live again, very much thanks to the people I’ve been working with. Leprous is very professional — no drinking, no partying. I trust them, and they always come through. My tour manager is fantastic. Everything is in order on that front. But it’s my priority to spend my time in the studio writing new music and producing music for others. I actually have some projects coming up where I will be doing more production work. It’s been less than two years since Emerita. That’s a very rapid release. It made sense because this is kind of a different album. I didn’t think waiting two years and then releasing something as far-fetched as this, and then waiting another two years before maybe a more metal-oriented album. It just made sense to do this quite shortly after. Most of the time, I try to focus on every second year releasing an album. It just fits my schedule to do it like that. Inspiration wise, I don’t feel I’ve run out yet, particularly not now that I’ve been able to do something so different. Now, I have a lot of time for the next one already. Why have you decided to do this one so differently, and based on improvisation? Because I wanted to challenge myself to do something that I haven’t done before. I saw this as having my go at doing something like Diamanda Galas or Scott Walker. You mentioned the lyrics seemed even more open to interpretation. My lyrics have always been personal, but because I haven’t gone back to re-work and redefine them, I wrote more lyrics in the spur of the moment. In that respect, these are more personally revealing than what I’m usually comfortable with. All in all, it’s just been a very exciting album to work on. A very painful album, to be honest. Making albums is always a struggle. Working with this kind of atmosphere with these kinds of subjects, you can’t be…It’s not happy-go-lucky. You have to take it from somewhere. But in heavy metal, it’s not always conventional or accepted to be a ‘personal’ writer or lyricist. Or a singer-songwriter in the way Galas and Walker are. In metal it’s more often personal experience filtered through kind of a mythic storytelling — which you did more in Emperor. I will agree with you that on the first Emperor record it’s very much a fantasy landscape, with woods and forests and storms and blah blah blah, but fromAnthems onwards, I think I’ve circled around very similar subjects: your own subjectivity in relation to your surroundings, to put it in a very objective way. Being in this kind of music scene and having maybe a different perspective on life than most, there is always a conflict in how you view and perceive things. This outsider perspective is something I’ve returned to all along, I found it in Emperor and continued it in my own work. I don’t see how lyrically now my work now is very different from that direction i’ve been going in all along. But why is it that in that metal scene you were the one who decided to talk about inner subjectivity? I don’t think I’ve been associated with this scene, the black metal scene. Scenes and genres are often seen as very collective, but my position in this outsider scene has also been kind of an outsider. It’s not that I’m antisocial, it’s just that I’ve never really grouped well! [laughs] Where others may have a perspective on the rulebook, on what is black metal or not and how it’s supposed to sound, I’ve had this attitude that black metal is about individuality. The minute you actually give any thought to doing it the right way, or what is trve or not trve, or let someone else decide what you can or cannot do with your music, that is by definition not black metal. Black metal is is a state of mind. It’s an attitude. And it’s all based around “let ‘do what thou wilt’ be the whole of the law.” For me it’s very hard to think of this collective group of people. We have the same references, but that doesn’t necessarily mean we stand together as a group thinking or saying the same thing. Most people play metal in bands as well, and it’s kind of unorthodox to break from this romanticism of you and your four friends all tooling in the same direction and blah blah blah. I think most people who have ever played in a band know it’s always one or two guys who have to do all the work, who have all the creativity, and the rest of the band just tags along. I’ve just had the experience to realize I’m probably not the easiest guy to work with, and as I consequence I do my stuff on my own.